Enjoy Smith Tower like you've never seen it before. Immerse yourself in new exhibits that take you on a journey through the past one hundred years. Make your way to the top of the tower for an amazing vantage point from the Observatory, including an open-air deck with 360-degree views of Seattle and beyond. Then take a moment to indulge in Prohibition-era inspired craft cocktails and shareable plates with a group of friends or your loved ones. And don't forget to make a wish in the Wishing Chair. It's the perfect selfie to post of your visit to Smith Tower. Please note that from January 15, 2018 to approximately May 22, 2018, the elevator that services the Observatory floor will be out of service, requiring all guests to walk up three flights of stairs (floors 32 to 35) to get to the Observatory and resulting in Smith Tower not being ADA-accessible during this period of time. 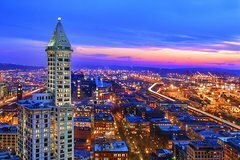 The Legends of Smith Tower exhibits will re-open May 16 with a refreshed visitor experience and access to the Observatory. On your way to the top of the tower, explore some of the stories, figures and moments that have made Smith Tower a cultural icon for more than one hundred years. Then, take a ride on the historic Otis elevators to the 35th floor where you'll be welcomed by stunning views and an exhilarating opportunity to take in 360-degrees of Seattle and Puget Sound from the open-air observation deck. Stay awhile and enjoy a craft cocktail or share a plate from our fun, locally-inspired menu.